1996 was a great year to live in Atlanta! We were proud to host the Summer Olympic Gam es. I was able to capture a lot images before, during, and after the games. 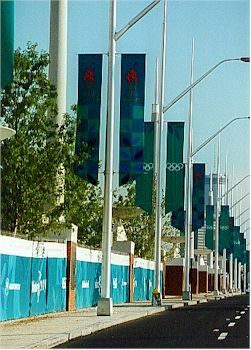 If you are wondering why I am displaying these in 2000 it's because I had to wait until the Atlanta Olympic Committee ceased to exist. All of the photos are my own work, and are copyright 1996 by Richard Weisser. The first photos are the calm before the storm. Notice how eerily devoid of people these shots are. The first photo is the open area between Centennial Olympic Stadium ( now Turner Field ) and the old Atlanta-Fulton County Stadium ( since razed.) Next is deserted Capitol Avenue. It is amazing to consider that within a few days these areas would be jammed with throngs of spectators . I was able to move about freely at this point, although the areas inside the venues were secure. I have grown up watching the Olympics, and when I looked up and saw the unlit Cauldron and the five Olympic rings, (next page ) it nearly took my breath away. 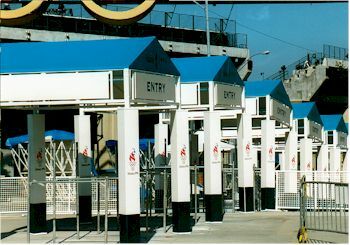 Soon the vacant turnstiles ( photo 3 ) would be brimming with folks from all around the world! 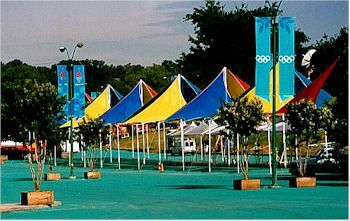 The city of Atlanta and all of the surrounding suburbs were getting ready to host the biggest party that the Southeast had ever seen. My biggest concern was having my camera ready and plenty of film available. I knew that the few weeks that the games were here would streak by quickly and I wanted to make sure that would use every opportunity to document what was happening from the perspective of the ordinary year-round citizen. I hope that you enjoy the show!